A few days ago, I needed a plugin to notify the site admins as well as the users of a WordPress site about the successful and failed login attempts. Though, there existed a few plugins like Login alert, but none of them was exact match for my requirement. I created this plugin, and finally sharing here and hoping that it may help you. 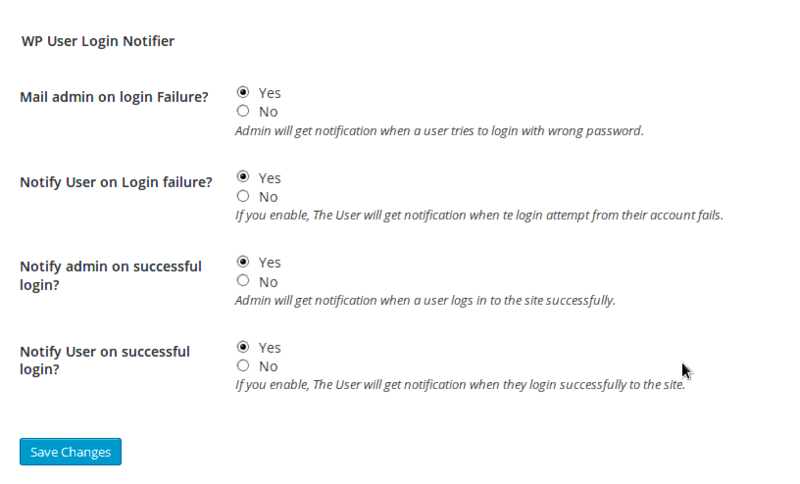 WordPress User Login notifier notifies users and admins of any login or failed login attempt on a WordPress site. You can turn off/on any of these four settings. By default all of these are turned on. Another note, the default notification method is email but you can swap it by writing another notification provider. Hope that it helps you to keep a tab on your site activities. Thank you. That is a very good idea and I will certainly implement it in the update. You can disable the successful login notification to the user from the settings page. I kept it to mimic the gmail like notification for login. I’ve just downloaded and activated this plugin, but see no “Settings-> WP User Login Notifier”, just “Deactivate”. What have I done or is the plugin a dud? This plugin is fully supported. Can you please enable WP_DEBUG and post me what you see there? Please post in our support forums here with the details.